Growing up in Maryland, my dad always made it a point to take my brother and me on “adventures.” These could be anything from sitting at the Metro station on a bench and watching the planes take off from National Airport to checking out all of the museums, to walking down the Potomac when the cherry blossoms were pink and snowing down on us. As a child, he even took us on a tour of The White House and Senate, where we got to take the underground train to a special dining room where all of the Congress people eat. It was really cool growing up in place that was in such close proximity to the nation’s capital. When I returned to Maryland after my road trip through Zion, the Rocky Mountains, Omaha, Chicago and Louisville, taking Erica to see DC was a must. On this day, we parked it outside the iron fence and looked onto the grounds of The White House. 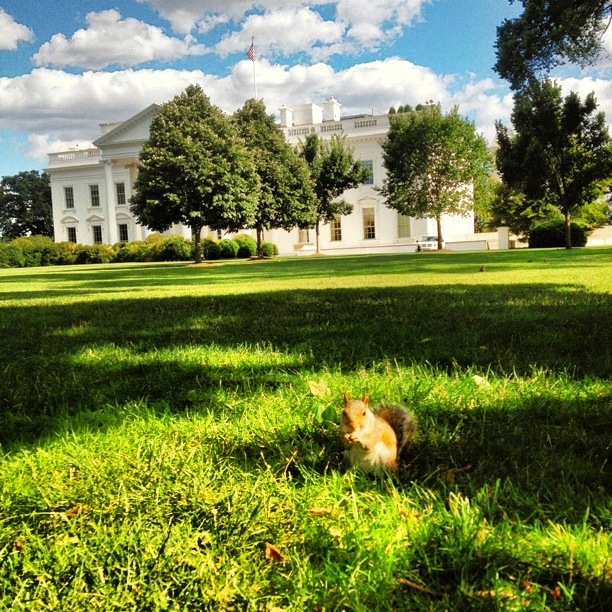 Here, this little guy enjoys a snack on one of the most famous lawns in the world. Hello, photobomb. They’d probably think you were homeless, but in reality you’d just be a drunk taking a nap, right? 😉 Love you hogga! I think you’d make a wonderful white house decoration. Pretty sure if I even tried to get on the lawn I’d be shot. Or, the very least, arrested! Hogga would make a fantastic WH decoration! Ha hahaaaaa!!!! Oh, Hogga. I need you to come to Thailand. ASAP.